FILE - From left, Texas Senator Ted Cruz and Arkansas Senator Tom Cotton applauded President-elect Donald Trump's decision to accept a telephone call from Taiwan President Tsai Ing-wen on Friday. 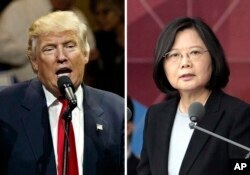 President-elect Donald Trump's telephone call with Taiwan's president on Friday broke decades of U.S. diplomatic policy in the region and brought a quick objection by China, but several Republican members of Congress have applauded Trump's decision to accept the call. "I would much rather have Donald Trump talking to President Tsai [Ing-wen] than to Cuba's Raul Castro or Iran's Hassan Rouhani," Texas Senator Ted Cruz tweeted Saturday. "This is an improvement." Cruz, one of Trump's main challengers and critics during the Republican presidential nominating contests this year, was referring to President Barack Obama, who has spoken to both Rouhani and Castro. China said earlier Saturday that it had lodged an objection to the telephone conversation Trump had with Taiwan's president. "We have already made solemn representations about it to the relevant U.S. side," China's Foreign Ministry said in a statement. "It must be pointed out that there is only one China in the world. Taiwan is an inalienable part of China's territory." Trump brushed aside nearly four decades of diplomatic protocol Friday to speak with Tsai. The U.S. broke diplomatic ties with Taiwan in 1979. Arkansas Senator Tom Cotton, however, approved of the phone call, saying in a statement, "I commend President-elect Trump for his conversation with President Tsai Ing-wen, which reaffirms our commitment to the only democracy on Chinese soil. "I have met with President Tsai twice and I'm confident she expressed to the president-elect the same desire for closer relations with the United States," he said. FILE - This combination of two photos shows U.S. President-elect Donald Trump speaking during a "USA Thank You" tour event in Cincinnati, Dec. 1, 2016, and Taiwan's President Tsai Ing-wen, delivering a speech during National Day celebrations in Taipei, Taiwan, Oct. 10, 2016. Arizona Representative Matt Salmon told The Hill he applauded Trump for "making a strong statement" with the telephone conversation. "I commend [President-elect] Trump for reaching out to the democratically elected president of Taiwan, Tsai Ing-wen," he said in his statement to the newspaper. Salmon, head of the House Foreign Affairs subcommittee on Asia and the Pacific, attended Tsai's inauguration, according to The Hill. Chinese Foreign Minister Wang Yi said Saturday that he hoped Beijing's relationship with Washington would not be interfered with or damaged by the telephone call. China's foreign minister characterized the conversation as "just a small trick by Taiwan." China claims democratically ruled Taiwan is part of its territory and has never renounced the use of military force to bring the island under Beijing's control. Trump had been widely criticized Friday for calling the Taiwanese leader, but responded to his critics in a message on his Twitter account, saying, "The president of Taiwan CALLED ME today to wish me congratulations on winning the Presidency." Later, Trump said on Twitter that it was "interesting how the U.S. sells Taiwan billions of dollars of military equipment but I should not accept a congratulatory call." When asked Saturday about Trump's Twitter message that said Tsai had been the one to initiate the call, Tsai spokesman Alex Huang said that "both sides agreed ahead of time before making contact." The White House said it was not told about the call until after it had happened. FILE - Sen. Chris Murphy, D-Conn., and colleagues speak with reporters on Capitol Hill in Washington, June 20, 2016. Some Democrats questioned Trump's departure from decades of U.S. diplomatic policy. 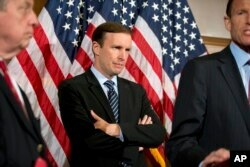 Democratic Senator Chris Murphy of Connecticut said on Twitter that it was Trump's right to shift policy and strategy, but "what has happened in the last 48 hours is not a shift. These are major pivots in foreign policy w/out any plan. That's how wars start." Senior Trump aide Kellyanne Conway dismissed such criticism, saying the call did not necessarily indicate a change of policy, according to the French news agency AFP. When questioned Friday whether the president-elect was aware of what U.S. policy has been on Taiwan, she told CNN, "President-elect Trump is fully briefed and fully knowledgeable about these issues on an ongoing basis, regardless of who is on the other end of the phone." The State Department declined to comment about whether it had been notified or asked to brief the transition team on current U.S. policy toward China and Taiwan prior to the phone call. "Our job is to offer support, whether that's in terms of facilitation, translation or context, which we have done and will continue to do," State Department spokesman John Kirby said Friday. "But the degree to which it's utilized is really for the transition team to decide, and it's really more appropriate for them to speak to," Kirby added. Reince Priebus, the chairman of the Republican National Committee who was named by Trump as White House chief of staff, met with Tsai in October 2015 while leading a Republican delegation to Taiwan. Experts said the conversation between Trump and Tsai showed a clear break with the so-called pivot to Asia and could be a "game-changer." "While one phone call certainly can't replace a clear strategy for Asia or the rest of the world, President-elect Trump has shown guts in shaking up the status quo on foreign policy issues that are of supreme importance," said Harry Kazianis, director of defense studies at the Center for the National Interest, a Washington public policy research group. FILE - Former U.N. Ambassador John Bolton speaks at the Southern Republican Leadership Conference in Oklahoma City, May 22, 2015. 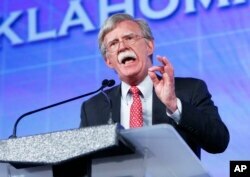 John Bolton, who was U.S. ambassador to the United Nations during former President George H.W. Bush's administration, met Friday with Trump. Bolton, who emerged as a contender for the next secretary of state, had advocated for "an upgrade" of Taiwan's relations with the U.S.
"The new U.S. administration could start with receiving Taiwanese diplomats officially at the State Department; upgrading the status of U.S. representation in Taipei from a private 'institute' to an official diplomatic mission; inviting Taiwan's president to travel officially to America; allowing the most senior U.S. officials to visit Taiwan to transact government business; and ultimately restoring full diplomatic recognition," according to a commentary article Bolton wrote for The Wall Street Journal this year. Carrier had announced earlier this year that it was planning to move about 1,400 jobs to Mexico. But now Carrier apparently has agreed to save the jobs of about 1,000 Indiana workers, following talks with Trump and Vice President-elect Mike Pence, who is still Indiana's governor. However, Sarah Palin, who strongly supported Trump during his campaign, condemned the deal on Friday, AFP reported. "When government steps in arbitrarily with individual subsidies, favoring one business over others, it sets inconsistent, unfair, illogical precedent," Palin wrote on the website Young Conservatives. "We support competition on a level playing field, remember? Because we know special interest crony capitalism is one big fail." Palin is a favorite of the far-right tea party movement, which values limited government and conservative values. VOA's Nike Ching at the State Department and Bill Ide in Beijing contributed to this report. * Editor’s note: President-elect Donald Trump and the Carrier Manufacturing Corporation claim that more than 1,000 jobs will remain in Indiana thanks to a deal struck between the incoming administration and Carrier.But several news organizations, as well as the head of the union representing many Carrier workers, say the actual number of jobs saved is around 800.VOA attempted to verify how many jobs were preserved, however the public relations department at United Technologies Corp., Carrier’s parent company, is not accepting questions from the media.